The Escapist has the story. 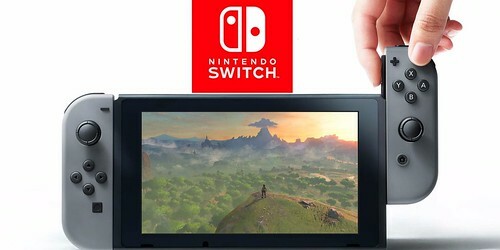 With just one week to launch, a number of people in the gaming press who have received the Nintendo Switch early are reporting connection issues for the Joy-Con controller, specifically the left controller. The video below showcases the issue, which appears to be occurring when the Joy-Con controller is covered or something is between the Joy-Con and the console. However, that's also when intentionally attempting to replicate the issue, so it's not immediately clear if that is the only time it is occurring. Click on the Headline for a Video Report from GameXplain. It's not a desync; the issue is being caused by Bluetooth tech. They're using Bluetooth 3.0, which operates at a higher frequency...but, this means the signal can get blocked easier. Essentially, the user's body is absorbing the Bluetooth signal in certain cases. Additionally, it's an issue that can be fixed with a firmware update to booth the strength of the signal. Last edited by Chimpbot; 02-24-2017 at 12:49 PM.. Odd that this wouldn't present as a problem when the joycons were attached to the joycon grip. No matter what it is, Nintendo normally as a reputation for producing really solid hardware so this is disappointing. And now I just read Chimp's post so never mind what I said. It's not a desync; the issue is being caused by Bluetooth tech. They're using Bluetooth 3.1, which operates at a higher frequency...but, this means the signal can get blocked easier. It's non news why? If this were MS the pitchforks would be out. Nintendo isn't perfect, they make mistakes. They're releasing a day one update to rectify the issue; actual consumers really won't be affected by it. It's a non-controversy caused by Bluetooth tech and can be easily fixed with a simple software update. It won't be an issue this time next week when the thing is officially out in the wild. It's likely caused by the way the joycons are being held when not attached to the grip; they're small enough that the user's hands are essentially blocking out the Bluetooth signal. A simple firmware update is all that is necessary to boost the power of the signal to more sufficient levels. Kudos to them for getting right on it then. Credit where it's due. Except if the antenna is TOO WEAK, you can't boot the signal via firmware. That would be like programming a 40 watt bulb to operate at 100 watts. This will be non-news when it's confirmed to be solved. Until it's solved it's a problem. They can say it will be solved, but until it is solved it isn't. It's not complicated. Until it's solved, it's not. That was pretty good, eh? Considering the fact they're using Bluetooth technology - supplied by Bluetooth - I'm sure all of the equipment in question is sufficient. Chances are, the amount of power being supplied to the Bluetooth radio isn't quiet sufficient enough as things currently stand. Assuming this is controlled by software (which is most certainly is), a firmware update will fix the issue. ...a firmware update will fix the issue. And yet, until it has, it hasn't. So...it's a problem! How many times have we heard the whole 'We'll fix it no problem' line and how often is it accurate? I work in a bureaucracy, and when someone says it's as good as fixed I get ready to wait, lol. I would suggest that this might end up being a major problem. If you hand is powerful enough to block the signal, then how will this thing operate when it is all the way across the living room from you? Hopefully they rectify this day 1. Sounds like they're going to as Chimpbot alluded to. 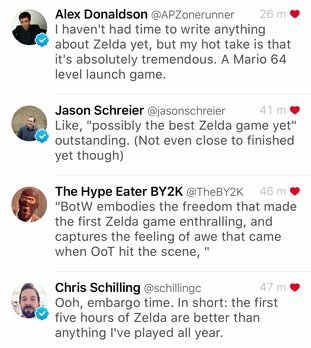 Previews are starting to roll out for Zelda: BotW and it seems like most journalists agree that the game is incredible, and some are even saying it could be the best game in the series or the best game of all time, as a leaked Polygon preview claimed. I love that last quote. It is like when you see a movie trailer and they go "The best family movie of the year!" and it is only February. Looking forward to the Switch, but I am going to hold my reservation on the quality of Breath of the Wind. Skyward Sword really disappointed me and the art direction of Breath of the Wind is really offputting (and I loved Wind Waker when it was released). "And maybe last year, too." "Put it this way: I'm playing a fantastic game at the moment for review, and yet I'm counting the moments until I get back to Hyrule." "It feels pretty special, folks. I think a lot of people are going to be very happy with it." To be honest, I loved Twighlight Princess when playing as wolf-link, when I wasn't forced to use the damned Wiimote controls, and Midna was genuinely interesting and entertaining. What I have seen of Breath of the Wind just has not elicited the same excitement I used to get when watching a Zelda trailer, and that is mainly because the art direction has taken oversatured and bloom too far. I think Witcher: Blood and Wine really nailed the "fairytale" look so it is going to be hard to not make a comparison to it. I hear ya. And Witcher 3 was an exceptional game to boot, so even harder not to draw comparisons. I hope Zelda lives up to the early hype, but we'll see. I'm not sure about the art direction either, but I DO like that they're doing different things. I guess it's a pretty difficult game and the physics based and environmental puzzles are very well done. We'll see how it all blends together.